First off I want to thank Andrew over at Frogs Kiss for sending me a list of Peter Cundill magic six stocks. A stock that qualifies for the magic six designation is trading with a P/E of 6, a dividend yield of 6% or greater and a P/B of 60% or less. Peter Cundill loved to invest in magic six stocks as discussed in the excellent book There's Always Something to Do: The Peter Cundill Investment Approach . Of the 53 stocks that qualify world-wide as a magic six none of them are in the US which I find fascinating. The first magic six stock I want to dig into is a British stock, Molins Ltd. Molins is a machinery supply company that builds equipment for three different customer types; Scientific Services, Tobacco Machinery, and Packaging Machinery. While at first glance it might seem like the product lines are diversified they are not; all deal with the tobacco industry. The Scientific Services group deals with machines and instruments for tobacco labs. The Packaging Machinery division creates machines that handle tubular product packaging. And finally the Tobacco Machinery division builds machines which are used in the manufacture, distribution, and processing of tobacco products such as cigarettes. The company has a long history in dealing with the tobacco industry, Molins was founded in the late 1800s and incorporated in 1912. The company started with the founder hand rolling cigars and cigarettes in Cuba which led him to design a machine to roll smokes automatically, a breakthrough at the time. -Investor return of 36% (ROE * B/P), this is the return an investor gets by buying at such a discount to book, if the company continues to earn a 13% ROE compounded on the low price paid for the company. The stock is cheap, and I mean absolutely cheap, after backing out the cash it's barely trading above 1x FCF. A dividend yield of 6% or above is unusual, it often means the company is in some sort of financial distress or the company is a REIT. The company seems to target a 20% payout ratio which is conservative. During the financial crisis the payout ratio hit the low 60s but still not high enough to cause any concern. I have a detail of the dividends and payouts for the past five years. 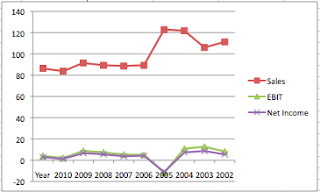 As you can see above the company appears to adjust the dividend policy based on profitability although it appears they might have been a bit hesitant to cut the dividend in 2009. Molins has been able to pay a consistent dividend throughout the financial crisis, I don't think a dividend cut is really much of a worry. In taking a look at a magic six stock I tend to put a lot of emphasis on the composition of book value. In most stocks I analyst I look at the net current asset value which is much more liquid than book value and usually the values are a bit more accurate as well. General book value could include intangibles such as goodwill or the values of a property and plant account that might not be realistic. The first item that sticks out as a potential item of concern is £14.7m of intangibles, this is likely a value that won't be realized in a sort of liquidation scenario. I looked at the annual report and there is a note (note 13) which discusses the intangibles, and found the item intangibles is goodwill amount carried on the books as a result of a few acquisitions in the Scientific Services group. The second item of note is the surplus for the pension account. It's a bit unusual to see a surplus for a company sponsored pension plan, especially in the last few years. The gross pension assets are £327m with a benefit obligation of £314. I like seeing the surplus but in reading the statements it appears to be a more recent development, as of June 30 2010 the company pension plan was operating with a £34m deficit. The surplus is a result from rising asset values. With the falling European markets I'm wondering if the surplus has disappeared since the interim statement came out. As mentioned earlier in the post Molins has £12m of cash on the balance sheet in addition to a sizable amount of inventory and receivables. As a whole the NCAV is 61p per share which is a liquidation value 32% lower than the current price. I think liquidation value is the absolute worst case scenario for book value. If we add in the £10m property plant and equipment amount in figuring out a base book value it rises from 61p to 114p or 26% higher than the current price. Book value and net current asset value are nice but I've been burned on "cheap" stocks without earnings in the past so evaluating the earnings and cash flow record is important to me. I grabbed the 10 year data from MSN money and put together a spreadsheet and a graph of sales, EBIT and net income for the past 10 full years. Sales have been pretty steady for the past six years following a drop earlier in the decade. 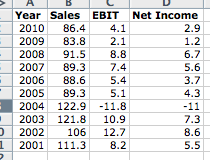 Although sales have been steady EBIT and net income are all over the place. Even though earnings are lumpy they are all positive except for a major loss in 2004. The company website only has reports back to 2005 available so I wasn't able to determine what made 2004 so significant. My gut feel is that they took some sort of write down in 2004 that resulted in the loss. Earnings and EBIT seem pretty decent, to double check the quality of earnings I also put together a little worksheet showing cash from operations, capital expenditures and then free cash flow. Looking at cash flow is always interesting. In 2008 there was a profit if an investor only focused on earnings yet the company went cash flow negative due to working capital changes. My guess is the company continued to build up inventory and then had a tough time working off the increase. Evidence of this is in the increased receivables and increased inventory for 2008. Overall for such a cheap company the earnings are decent and while not steady and predictable it does seem likely that they will continue to be profitable into the future. And considering the long history of the company and the ability to mostly be continually be profitably I think a P/E higher than 6 is probably deserved. Molins isn't going out of business anytime soon, a P/E of 10 is probably more appropriate. This is a question that has been nagging me since I first started looking at Molins, why would a decent company be selling so cheap? The first answer is that the size of the company is tiny and there are a lot of inefficiencies with small companies. While that's true it's not a very satisfying answer. I went digging through the messages at ADVFN.uk to see if there was anything value related to Molons. It seems that the elephant in the room is the enormous pension account. Currently the pension is in the black, but with markets volatile it could easily swing negative and be a large liability on the balance sheet as well. A lot of posters on ADVFN seem concerned about the size and gains/losses with the pension. I'm not sure if this is some sort of conservative British concern or something legitimate. In the US companies run a negative pension balance for years without a problem, there is a day of reckoning eventually but usually it's a LONG way off. Molins occupies a middleman position in the cigarette supply chain, they make the tools that are necessary for cigarette production. The company is cheap on both an earnings and book value basis and pays a generous dividend. I'm not sure how much upside is realistic on an earnings basis but even if there is a little getting paid 6% to wait seems worth it. I'm not entirely comfortable with the company yet so I'm passing on an investment at this time. I'd love to hear anyone's opinion on Molins. Disclosure: No position in Molins. I receive a small commission for each item purchased through the Amazon link. The price paid through my link is the same as if you went to Amazon.com on your own. The commission cost is built into every item Amazon sells. Appreciate all the detail in this post. But really, in any potential investment like this (microcap, extremely cheap, etc..), the research space dedicated to "why is it cheap" relative to the rest of the post should be reversed. I.e. the most important piece is answering the question of why it's cheap and more importantly, why the market is wrong in that regard. Without extensive and definitive analysis in this area, the rest becomes more useless. Thanks for the comment, you bring up a very good point with regards to answering the question why is the company cheap. With Molins I believe some of the cheapness is related to the pension and it's size (20x the mcap) but even still I'm not satisfied with that answer which is why I haven't invested in them. What I think this boils down to for me is a margin of safety. I think there is a difference in a company being cheap (for right reasons) and cheap (for good reasons as well) with a margin of safety, where even with issues I can be enticed to invest if a margin exists. I think with Molins the safety doesn't exist even though the company is cheap. Your comment really highlights that I do need to spend more time in the future considering why a stock is trading at such a low level. Thanks again! Good article, but I very much agree with WSM. A stock with strong returns on capital, selling for 6 times earnings and half of book value, is going to have something wrong with it. Or maybe nothing wrong but something percieved to be wrong by the market. Even tiny stocks won't sell at crazy valuations for no reason. The facts of it's quantitative cheapness (i.e the bulk of the article) could probably be summed up in 2 or 3 paragraphs. Refuting the reasons why it deserves to sell at such a low valuation is what determins whether this is indeed a future money maker. Check out the molins website. There is an analyst report on it by Edinson. Look at page 7 of the report. Gross liabilities for the pension scheme are 328m and Market cap is 18m. A 5% move in pension liability is almost equal to the Market cap. 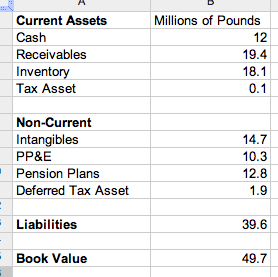 Having worked with British companies with liabilities this means this is a shocking balance sheet. I think you should spend your time on something else - and I think your blog is great so keep up the good work. Thanks to the great comments. The most recent commenter hit the nail on the head the issue with Molins is the pension. I had an offline conversation with an investor that confirmed this view. I was aware of it when I wrote the post but downplayed it too much. In reality a slight movement in the pension downwards could end up sucking up all of the FCF for years. Even worse if a loss in the pension is big enough the pension could end up owning the company. This is coming a bit late but as to why its cheap, you don't need to write much more than you did. Its indeed the pension fund, pension fund, pension fund, followed by a difficult operating history including one blooper on an acquisition (Sasib in tobacco machinery). 2004 saw a restructing charge of 11.3m largely due to that. Fortunately management changed several years ago and the business looks healthier than it has in many years due to asset sales, off-shore production and restructuring. It went through the 2007-10 period without major problems and this year has traded well under the circumstances. The worry about the pension fund is as you, and others, write its sheer size relative to the company. To an extent this is well founded as UK pension funds can require companies to put up a lot of money in the event of shortfalls (Molins is currently topping up its pension fund by 1.2m/annum or so (from memory), over and above the normal service charges - this is in CF but not EBIT). Furthermore any sale of a division or the company, or a split-up would effectively have to be vetted by the pension trustees making it difficult. UK pension rules are much more onerous than US ones for example but they are what they are. Currently the single biggest issue for the fund's position is the discount rate (related to interest rates, which obviously are extremely low) rather than investment returns. What the market appears to forget is: 1) the pension fund is rather old and the number drawing pensions is already high, so on the bellcurve of payments you're already well into the higher payment areas. 2) the cost of doing that is to a large extent covered by the ongoing annual service costs Molins expenses and pays (i.e. the cash cost to Molins won't grow much as what they pay in is not far removed from what the fund pays out), 3) as mentioned the company is shelling out 1.2m/year extra in cash to top up the reserves despite a H1 surplus, and 4) future obligations are valued not terribly far from their nominal value due to the very low current discount rate - were interest rates to increase these obligations would shrink fast based on this methodology. The irony of low interest rates is that a pension fund almost requires its total cumulative nominal payments to be paid up in full today, which is ludicrous given the 30+ year period you're talking about. But from a margin of safety viewpoint it is reassuring that rates are already very low and this means obligations (and thus a possible deficit) can only grow so much. If you believe in mean reversion rates in the longer term will rise thereby shrinking obligations and decreasing the deficit/increase the surplus. The risk that all of major parts of Molins'EBIT or cash reserves would funneled to the pension fund is therefore extremely remote. Don't forget as well that any potential deficit arising in the ST can be eliminated over a multi-year period under pension recovery schemes thus smoothing out and decreasing the annual cost (this is, for example, what they are doing with the top-up stemming from a couple of years back). The idea that the pension fund could own the company is theoretically possible, but practically impossible - again for the reasons mentioned and a few I haven't. So yes the pension fund is an issue. But even barring an improvement in the operations (not so far fetched on 1-3 year horizon - a couple of businesses are doing well while packaging is weighing on the whole) it is difficult to justify why the pension fund should lead to such a low valuation. In that respect its worth diving into the details and beyond the simple headlines. I just wanted to say thanks for the last comment, extremely informative, and clears up a lot of the ambiguity around the pension.